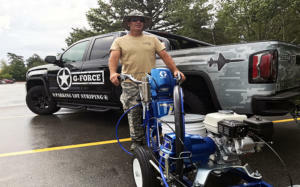 Founded in 2017 and franchising since 2018, G-FORCE™ is a franchise built by veterans for veterans that provides expert Parking Lot Striping, Pavement Marking, Sign Installation Services and more. Today, there is one location servicing various parts of New Hampshire and Massachusetts. For more information, visit www.gogforce.com. 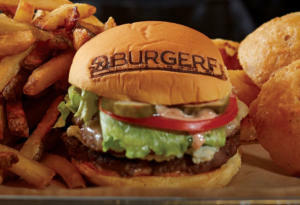 BurgerFi, among the nation’s fastest growing, award-winning better burger concepts, will launch a new marketing campaign which will feature the tagline “BURGERS for Every 1.” The campaign will focus on the company’s mission to serve only the top 1% of best-tasting certified, American Black Angus beef from the top ranches across the country. Known for delivering the all-natural burger experience in a fast-casual environment, the brand has a commitment to quality food that ensures no steroids, antibiotics, growth hormones, chemicals or additives are ever used. The new advertising campaign, created by Rochester, New York-based agency Partners + Napier, highlights the fact that everyone has a niche and ability to excel in something and they deserve to celebrate what qualities make them unique with a burger that is special too. Creative assets will also correlate these qualities to specific burgers on the menu and feature fun, unexpected imagery and headlines. The unique alpha-numerical tagline is representative of both the top 1% of beef used by BurgerFi that “never-ever” contains hormones, antibiotics, steroids, or additives, and the perspective that BurgerFi restaurants will continue to serve the millions of one-of-a-kind guests. From chef-driven menu items including their unrivaled certified angus craft burgers, their newest plant-based Beyond Burger, hand-cut fries and onion rings to Vienna hot dogs, frozen custard and shakes, BurgerFi offers guests an uncompromising and rewarding dining experience. The campaign will begin rolling out on January 29 via national and local digital media, pre-roll video, radio, social media, billboards, email and in-store displays. Established in 2011, BurgerFi is among the nation’s fastest-growing better burger concepts with over 100 restaurants. The concept was founded by gourmet chefs committed to serving fresh food of transparent quality. BurgerFi uses only 100% natural Angus beef patties with no steroids, antibiotics, growth hormones, chemicals or additives. BurgerFi was included in Inc. magazine’s Fastest Growing Private Companies List, #4 on Fast Casual’s 2017 Top 100 Movers & Shakers list, and ranked on Entrepreneur’s 2017 Franchise 500. The company was also ranked as one of the top 10 fastest and smartest-growing brands in franchising and a leader in the better burger category by Franchise Times in their Fast and Serious list for 2017. Visit www.BurgerFi.com for more information. To learn more about BurgerFi or to find a full list of locations, please visit www.burgerfi.com, ‘Like’ BurgerFi on Facebook, or follow @BurgerFi on Instagram and Twitter. Planet Fitness, Inc., one of the largest and fastest-growing franchisors and operators of fitness centers in the U.S., today announced the upcoming opening of its first club in Monterrey, Mexico. The country’s first Judgement Free Zone® in Santa Catarina is expected to officially open this spring. Planet Fitness has over 10.5 million members with clubs located in all 50 states, Puerto Rico, Canada, the Dominican Republic and Panama. Founded in 1992, Planet Fitness is known for the combination of its high-quality fitness experience, affordable prices, and hassle-free, non-intimidating environment known as the Judgement Free Zone®. Each Planet Fitness location features the brand’s iconic “Lunk Alarm” – a purple and yellow siren on the wall used as a light-hearted reminder that grunting, dropping weights or judging others is not permitted. As a member appreciation gesture, Planet Fitness Santa Catarina will provide free pizza on the first Monday of every month and free sweet bread, known locally as pan dulce, on the second Tuesday of every month while supplies last – a reminder that it’s okay to treat yourself every once in a while after a good workout. The Santa Catarina club will feature brand-name cardio and strength equipment, circuit training, fully-equipped locker rooms with day lockers and showers, numerous flat screen televisions and free small group fitness instruction by certified trainers. PF Black Card® members will have the ability to bring a guest at no additional charge and have access to HydroMassage® recliners, massage chairs, PF Cuts, and much more. JEG-Fit LLC, a Planet Fitness franchisee group since 2011, is the owner and operator of the Monterrey location and currently owns 19 locations throughout Arizona and Washington. 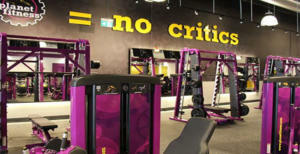 To find a Planet Fitness club or learn more about the Judgement Free Zone®, please visit PlanetFitness.com. Founded in 1992 in Dover, N.H., Planet Fitness is one of the largest and fastest-growing franchisors and operators of fitness centers in the United States by number of members and locations. As of September 30, 2017, Planet Fitness had approximately 10.5 million members and 1,432 stores in 49 states, the District of Columbia, Puerto Rico, Canada and the Dominican Republic. The Company’s mission is to enhance people’s lives by providing a high-quality fitness experience in a welcoming, non-intimidating environment, which we call the Judgement Free Zone®. More than 95% of Planet Fitness stores are owned and operated by independent business men and women. Rachel’s Kitchen, a “fresh casual” restaurant concept that offers a carefully crafted menu, from the healthy to the indulgent, has expanded its Friends of Rachel’s initiative to include several additional charity organizations, bringing the total to 12 partner organizations. Most recently, Rachel’s Kitchen worked with the Vegas Strong 5K/1M, providing all the food at the event for the 2,750 runners who participated to remember those who lost their lives and to honor the survivors and first responders of the October 1, 2017 shooting; the event raised $65,000 in total. 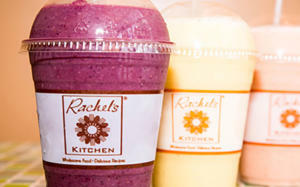 As part of the Friends of Rachel’s program, Rachel’s Kitchen will donate a portion of the proceeds earned during a set amount of time to the selected partner organization. In doing so, the restaurant not only helps raise necessary funds, but also raises awareness for a variety of causes, ranging from education and animal causes to health advocacy and child care services. When Roxarzade opened the doors of her first Rachel’s Kitchen, her goal was to serve fresh, high quality and great tasting food at affordable prices. In addition to bringing great food to the table, she wanted the restaurant to be an active community partner. Today, Rachel’s Kitchen is dedicated to giving back to the communities they serve through charitable giving at all levels of the company, from the corporate office to the franchise level. The burgeoning brand offers a carefully crafted menu – from the healthy to the indulgent – using the freshest ingredients available, often locally sourced. Menu highlights include: Breakfast, Salads, Gourmet Sandwiches, Wraps and Juices. A combination of the walk up, carry out experience and a traditional sit-down restaurant, guests place their order at a counter using a wall mounted menu before retreating to a table where the food is brought directly to them, leaving them to comfortably enjoy their meal and a moment of serenity from whatever stresses the rest of their day may hold. A new and innovative Sharkey’s Cuts for Kids Therapeutic Kids Salon will be launched in 2018, in the Talpiot Children Village, situated in Hadera, Israel, and will serve the 200 children and youth at-risk residing there, and their families. 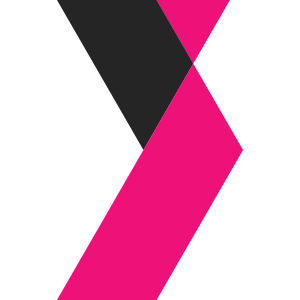 Talpiot is a non-profit organization whose mission is to reduce the number of at-risk children and youth in the region of Hadera and prevent risk situations in the family. Talpiot provides a comprehensive spectrum of community-oriented programs for the at-risk children and youth population and their families living in the region. Thanks to the generosity and commitment of Scott Sharkey, this Sharkey’s Cuts for Kids salon will offer a fun-oriented, therapeutic experience for the children and for their families, in line with Talpiot’s unique child and family focused model for elimination and prevention of at-risk situations. It will serve as a unique and creative tool to strengthen the bond between at-risk children and their parents, to empower the entire at-risk family and thus contribute to the success of Talpiot’s mission to rehabilitate such families and return the children home. 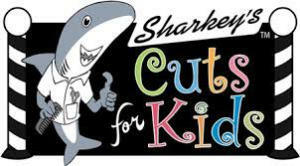 The Sharkey’s Cuts for Kids Therapeutic Kids Salon will offer special activity programs for parents and children; recreational and creative art programs for the children; birthday parties; and joint activities with the community. The Talpiot Village is situated in a quiet and pleasant residential neighborhood and includes: a full residential facility of ten foster family units (120 children); and an after school day care facility of six groups (90 children); a therapy center; arts and music center; adventurous outdoor park; zoo and animal petting; sports facilities ; and a community synagogue. The children referred to the Village receive a warm, supportive and protective embrace, which entails a variety of specifically individualized therapies i.e. : individual and group therapy; music, drama, movement, art, animal petting, and photography therapies. They participate in specially structured activities with their parents, which aim to improve communication and empower the relationship between them. They also enjoy recreational and enrichment activities in the afternoons i.e. scholastic reinforcement and homework assistance; excellence promoting activities; music education, choir, dancing, various sports, art, photography and drama. The Village is the core project in the organization’s regional continuum of services for at-risk children and families. This continuum consists of some 16 different community services in the region, all based on the Talpiot family-focused care model, which impact some 1,000 children and families. The technology divide between older and younger generations may not be as wide as you think. According to a recent survey of 1,000 seniors issued by Senior Helpers®, the nation’s premier provider of in-home senior care, more than 68 percent of people ages 65+ rate their technology skills either average or above average. The survey, which examined seniors’ attitudes on everything from apps and internet usage to social media habits, also found that while most would not consider themselves “tech-savvy” (71 percent), nearly 60 percent of seniors think younger generations underestimate their knowledge and aptitude for technology. When asked what tech innovation they couldn’t live without, 29 percent of senior respondents reported a cell phone. Most (nearly 70 percent) use a smart phone, and 38 percent use an iPhone. However, 13 percent still don’t own a cell phone. TV followed closely at 27 percent, with iPad/tablet (almost 11 percent), CD/MP3 players/stereos (6 percent) and GPS (4.5 percent) trailing further behind. Thirty-two percent of seniors spend more than 20 hours a week on the internet, with 10 percent of those online for 40-plus hours per week. More than half of seniors use Facebook as their social media site of choice. 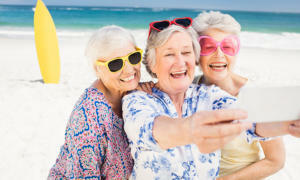 Less than 8 percent of seniors combined favor Pinterest, Instagram or Twitter. When it comes to app usage, seniors use social media apps the most (almost 23 percent), followed by maps/navigation services (17 percent), online banking (14 percent) and games (8 percent). When asked in a lighthearted way what movie best describes their relationship with technology, 28 percent of participants said Beauty and the Beast “because they had to warm up to it.” Another 28 percent noted Mission Impossible because they “can’t keep up.” Others likened it to Fight Club, admitting they “don’t like it but use it” (24 percent); or Cheaper by the Dozen, appearing to welcome technology (“Give me more gadgets!” at 19 percent). Founded in 2001 with a vision to help seniors who wish to remain in their homes – despite age-related illnesses and mobility challenges – Senior Helpers serves elderly individuals and their families around the world. Senior Helpers differentiates itself with its proprietary, specialized programs that have been developed in collaboration with leading medical experts. The company was the first provider in the industry to offer specialized care services for individuals with Alzheimer’s, dementia and Parkinson’s disease. For more information about Senior Helpers, visit http://www.seniorhelpers.com. Senior Helpers is a premier in-home senior care provider in the U.S. with over 311 franchised businesses operating across the globe. Founded in 2001 with a vision to help seniors who wish to remain in their homes despite age-related illnesses and mobility challenges, Senior Helpers has now cared for tens of thousands of seniors with a pledge to provide “care and comfort at a moment’s notice.” Senior Helpers offers a wide range of personal care and companion services, including trained Alzheimer’s, dementia and Parkinson’s care, to assist seniors who wish to live independently. Learn more by visiting http://www.seniorhelpers.com. 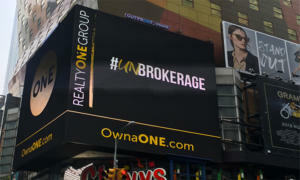 Realty ONE Group, the fifth-largest independent real estate brand and one of the fastest-growing real estate franchisors in the nation, has launched its largest advertising campaign to date with a historic media blast throughout New York City’s iconic Times Square district. 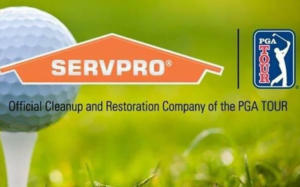 SERVPRO has extended its sponsorship with the PGA Tour through the 2020 season, retaining its designation as the official cleanup and restoration company of both the PGA Tour and the Champions Tour according to Sue Steen, Servpro Industries, Inc., chief executive officer. SERVPRO’s first event of the 2018 PGA Tour season tees up this week with the Farmers Insurance Open at Torrey Pines Golf Course. Steen reveals that SERVPRO will have a presence at several PGA Tour tournaments in 2018, including The Players Championship and The TOUR Championship. “In addition, we plan to be involved with First Responder events throughout the PGA Tour year,” said Steen. SERVPRO specializes in disaster restoration, cleanup and repair services, helping to remediate damage, making it “Like it never even happened” for both commercial and residential customers. For more information on SERVPRO please visit www.servpro.com/. Love and hugs abound at Build-A-Bear Workshop®, Inc., an interactive destination where Guests can create personalized furry friends, as the company unveiled a new collection of Valentine’s Day gifts that are sweeter than ever. Build-A-Bear Workshop® today announced a new collection of Valentine’s Day gifts that are sweeter than ever, including Make-Your-Own Sugar Scent™ furry friends that feature a sugar-scented fragrance. The signature Build-A-Bear Workshop heart ceremony, where you and your Valentine make a wish on a heart and place it inside your furry friend. The opportunity to add a heartfelt message to any Build-A-Bear furry friend with a Personalized Record Your Voice™ sound chip, sharing your sentiment. A variety of classic teddy bears, furry friends and licensed characters to choose from, with outfits and accessories that are Cupid-approved. The new Make-Your-Own Sugar Scent™ furry friends are cuddly (calorie-free) “treats” featuring a fragrance that gets sweeter with each hug. Sugar Scent Hearts Kitty™ is a friendly 16-inch feline with adorable hearts on its fur that can be customized with a tutu, pink cupcake accessory and more. 16-inch Sugar Scent Tiny Hearts Bear™ features white fur covered in pink hearts and can be dressed in a heart skirt set and plush heart lollipop. Sugar Scent Pup™ is a 16-inch playful pup with black and white fur and adorable eyes. Add a blue “HUGS” hoodie for even more puppy love. Each Sugar Scent furry friend is available for purchase separately in Build-A-Bear Workshop stores and online, or as part of a gift set that includes an outfit and accessories, such as a plush cupcake or lollipop, at buildabear.com. The sugar-scented fur is made possible by Celessence™ Technologies microencapsulation. With a heart-shaped texture on its fur, the Red Hot Red Hearts Bear (available in select stores and online) is ready for hugs. An online-exclusive version of this furry friend – available at buildabear.com – can be personalized with up to three lines of embroidered text to share a message with someone special. For even “bigger” fun, check out the 3-foot Jumbo Red Hot Red Hearts Bear – available in select Build-A-Bear Workshop stores and online – as well as the online-only Personalized Jumbo Red Hot Red Hearts Bear. If your loved one deserves a gift that’s extra hug-worthy, a teddy bear dressed in a Cupid Costume (available online and in select stores) or the online-only Knight in Shining Armor Costume is sure to have them love-struck. The entire Build-A-Bear Workshop Valentine’s Day collection – including a Chocolate Covered Strawberry Costume – is available at buildabear.com. The mischievous Peter Rabbit just hopped into Build-A-Bear Workshop stores and buildabear.com for the first time ever – weeks ahead of the release of the Peter Rabbit film! Beloved by generations of fans, this adorable furry friend loves nothing more than a good adventure. Plus, you can add Peter Rabbit’s signature blue jacket and 5-in-1 phrases – voiced by actor James Corden – to this special movie-edition bunny. From the NFL and NBA to over 50 college teams and more, Build-A-Bear Workshop has the perfect gift for your sports-fan Valentine. With official, team-branded furry friends – plus complementary uniforms and accessories – you can create an “athlete” that’s personalized (you can even add your voice or a favorite scent!) just for your Valentine’s Day “teammate.” Licensed sports products are available in select stores and at buildabear.com. Now through Feb. 15, 2018, U.S. Guests of Build-A-Bear Workshop can support Make-A-Wish® by making a donation in stores or online. All donations will go directly to Make-A-Wish and help grant wishes of children with critical illnesses, which can help them build physical and emotional strength. While the northeast United States braces for record-breaking winter storm conditions, residents of Puerto Rico are still struggling to return to life-as-usual two months after Category 5 Hurricane Maria devastated the island on September 20th. As of the beginning of 2018, more than 70% of residents still do not have electric power, and more than 250,000 homes that were destroyed have yet to be rebuilt. Thankfully, Church’s Chicken® has been a consistent bright spot for the people of Puerto Rico, thanks to the diligent efforts of its local franchisee, South American Restaurants Co. (SARCO). The group, which operates 110 Church’s restaurants on the island now reports that 98% of locations are open for full service – providing much-needed hot, hearty meals and clean drinking water to the thousands in need. The SARCO group, which has been in Puerto Rico for nearly 40 years, made several decisions along the way to prepare their restaurants for hurricane conditions that are common in the Caribbean from June through November each year. In doing so, 10 Church’s Chicken restaurants were re-opened the day after Hurricane Maria hit, and other restaurants quickly followed suit. SARCO also came to the aid of its community in the true Church’s spirit of “Stepping Up” and “Doing the Right Thing” by donating 35,000 hot meals, 120,000 bottles of water, and 50,000 gallons of diesel fuel. Founded in San Antonio, TX in 1952 by George W. Church, Church’s Chicken® is one of the largest quick service restaurant chicken chains in the world. Church’s® specializes in Original and Spicy Chicken freshly prepared throughout the day in small batches that are hand-battered and double-breaded, Tender Strips®, honey-butter biscuits made from scratch and freshly baked, and classic, home-style sides all for a great value. Church’s® (along with its sister brand Texas Chicken® outside the Americas) has more than 1,600 locations in 27 countries and international territories and system-wide sales of more than $1 billion. 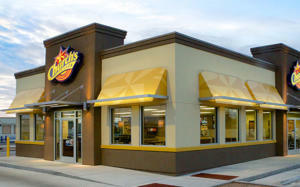 For more information about Church’s Chicken® or Texas Chicken® franchising opportunities, visit http://www.churchs.com/franchise_get-started.php. For more information about Church’s Chicken visit www.churchs.com. Follow Church’s® on Facebook at www.facebook.com/churchschicken and Twitter at www.twitter.com/churchschicken.